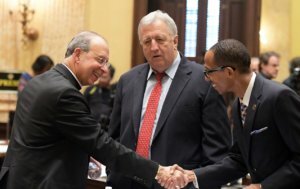 As he led the invocation before the Aug. 14 Baltimore City Council meeting, Baltimore Archbishop William E. Lori prayed for peace and unity following the brutal display of hatred and violence in Charlottesville, Va., two days prior. City Councilwoman Mary Pat Clarke, who represents District 14, said prior to the meeting that the council was honored to have the archbishop open. She said she felt “outrage” following the events of Aug. 12 in Charlottesville, beginning with a show-of-force gathering of white supremacist groups and resulting in the death of 32-year-old Heather Heyer, a Virginia resident. Police say James Alex Fields Jr., 20, of Ohio, deliberately accelerated his car into a group of counter-protestors who were present to oppose the white supremacists. He had been photographed earlier the same day marching with the supremacist groups and faces charges including second-degree murder for the collision that resulted in Heyer’s death and injuries for nearly 20 others. Following Heyer’s death, Lt. H. Jay Cullen and Trooper Berke M. M. Bates, both of the Virginia State Police, died when the helicopter they were piloting to monitor the violent demonstrations crashed. Earlier Aug. 14, Mayor Catherine Pugh announced intentions to remove all of Baltimore’s monuments to the Confederates. Archbishop Lori told the Catholic Review that as he watched the events of Aug. 12 unfold, he primarily felt sadness. He said he prayed not only for Charlottesville but that such violence would not reach other communities, including Baltimore. “I think every citizen, every believer can contribute to a just society and drown out the voices of bigotry and hatred,” Archbishop Lori said.